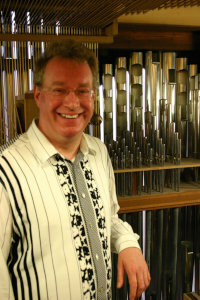 THE JIM LODGE RECITAL – given in memory of a much-loved organist, stalwart attendee at the Binns recitals and longstanding treasurer of the Nottingham and District Society of Organists; the recital is generously sponsored by Jim’s daughter Dr Mary Whitby. Franz Liszt: Prelude and Fugue on B.A.C.H. Peter King’s recordings of Liszt have received high praise, so an excellent introduction to them is the blockbuster Prelude and Fugue on B.A.C.H. Saint-Saëns’s first Fantaisie is tuneful throughout, and after we have become classical with an Albinoni concerto and Bach-pioneer Mendelssohn’s revival of that classic form the Prelude and Fugue, there is a Victorian close to the first half from Henry Smart. No shortage of tunes in the second half: Guilmant makes a virtuoso piece out of a chorus from Messiah, then Grieg goes on to celebrate his own silver wedding in both festive and reflective mood. There are many legends about who Handel’s harmonious blacksmith was, but we are on surer ground with Edwin Lemare, who opened the Albert Hall organ in 1910; his wife ensured that his famous tune became a pop song. And lastly, let there be light! Dubois takes us from the tiniest sounds to send us out on full organ.